• Continue from selected action without resetting the log. This option is only enabled when the previous run ended in error. Restarting the build will append to the existing log instead of starting a new log entry. • Run from Current Action - the build starts from the currently selected action and runs to the end of the current action list. • Run Selected Actions - runs just the currently selected actions. 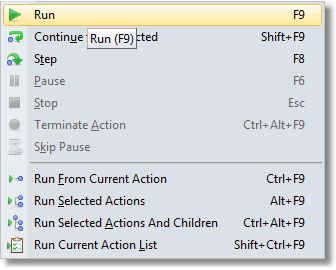 • Run Selected Actions and Children - runs the currently selected actions and any child actions. 4. Right-click context menu of an action. • Step - If the run is paused, it will run the next action and pause. If the run hasn't started, it will run the first action in Main and then pause. • Pause - The build will pause after the current action completes. • Stop - The build will stop after the current action completes. Some actions will stop prematurely if Stop is pressed, but most will not. • Terminate - FinalBuilder will attempt to terminate the currently running action, and immediately stop the build. Terminate is a more abrupt version of Stop. Some actions don't support being terminated.